Join Black Sci-Fi.com where we will be representing at two conferences in one weekend. First, BlackSci-Fi.com correspondents, M’Shai Dash and Tiara Wigfall will be representing for Black Sci-FI.com at the Black Nerds Expo on February 28. They will also be taping for Black Sci-Fi TV while tabling and selling items related to black and African-American superheroes, video games, and/or pop culture. 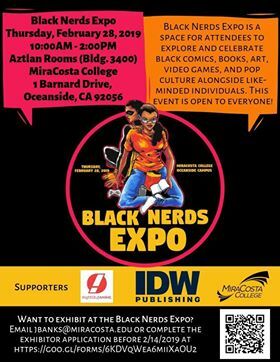 “The Black History Month Planning Committee at MiraCosta College is celebrating arts, comics, video games, and pop culture with the Black Nerd Expo on Thursday, February 28 from 10:00AM to 2:00PM at the Oceanside Campus’s Aztlan rooms (1 Barnard Drive, Oceanside, CA 92056). On March 1 we will also be in attendance at The United Black Student Conference (UBSC). From the event website, “UBSC is a high school and college conference for black students in the North San Diego County.” BlackSci-Fi.com team members will be participating in a presentation on black superheroes from 12:30 to 1-PM.